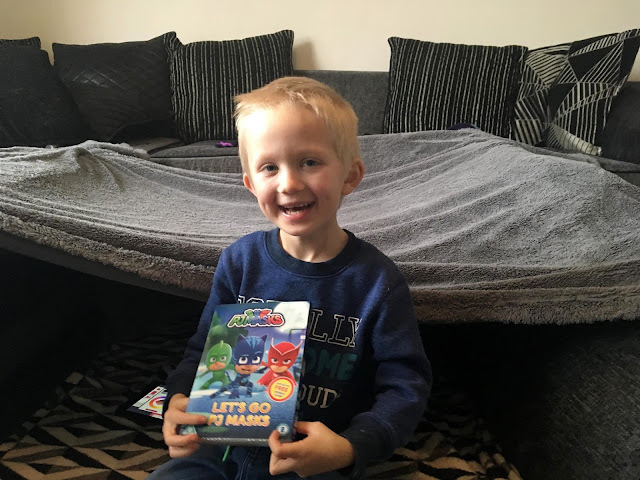 If you are a regular reader to the blog, then you will know that Riley is a huge PJ Masks fan. I am pretty sure he has seen all the current episodes and he also has a great collection of figures and toys. In addition to this, he also told me that he regularly plays PJ Masks with his friends at school, where they pretend to be the different characters and "Go into the night, to save the day!" whilst running around the playground. Last October we reviewed the PJ Masks Time to be a Hero DVD which has seen plenty of use over the last couple of months. 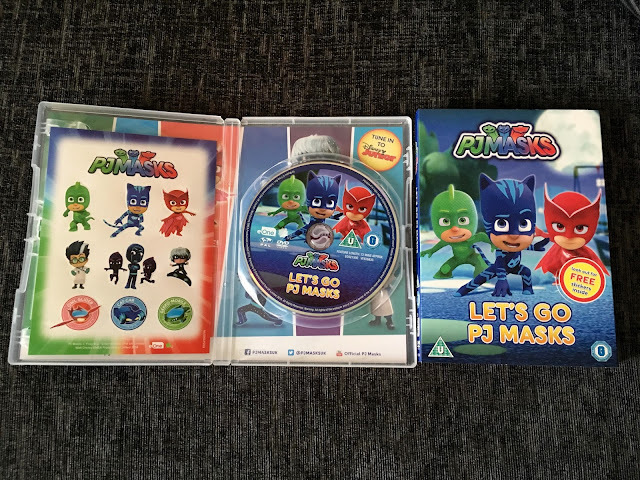 Riley was therefore delighted to receive the brand new Entertainment One (eOne) PJ Masks DVD in the post this weekend called Let's Go PJ Masks. Our previous DVD was packed full of crime-fighting and adventurous fun and so we were looking forward to watching the PJ Masks trio solve some more mysteries and work together as a team. 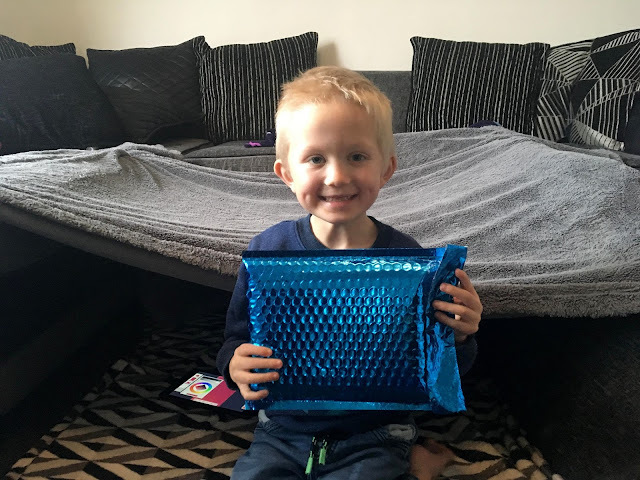 We had been busy building dens in the living room hidden away from the pouring rain outside, so Riley's special delivery came just at the right time as I handed him his parcel from the postman. With the den, blankets and snacks at the ready, it was the perfect setting for enjoying some superhero fun! 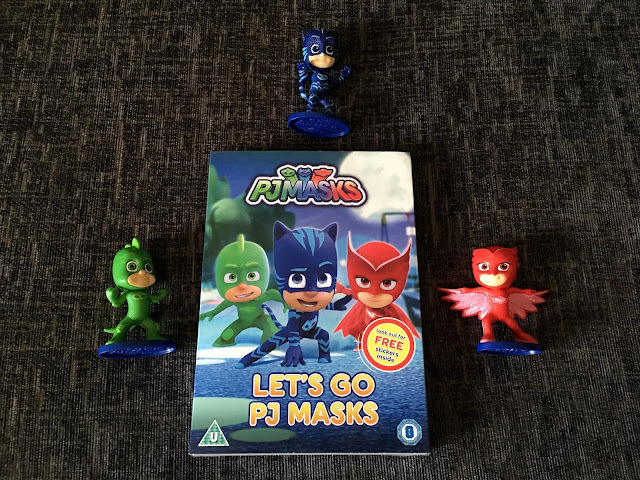 If you are unfamiliar with the series, then PJ Masks depicts the tales of Conor, Amaya and Greg who by day are three normal school kids but by night, if the city is in danger the trio put on their pyjamas and activate their animal amulets. They magically transform into their superhero alter-egos: Catboy, Owlette and Gekko and together make an unstoppable team. Gekko & the Snore-A-Saurus - Luna Girl turns a sleep-walking Cameron into her very own human puppet. It's up to PJ Masks to save the day...but Gekko has to stop messing around first! Catboy and the Shrinker - Romeo and Night Ninja team up to shrink the PJ Masks with Romeo's shrinker invention. When Catboy gets shrunk, he forgets that even a little guy can save the day...if he can use his small size to his advantage. Blame it on the Train, Owlette - When the new Fairground Flyer Train goes missing from the fair, Owlette is determined to get it back quickly. But if she wants to defeat Romeo's new super train, she'll need to learn that a little patience goes a long way. Looking after Gekko - When Night Ninja steals the school bus and converts it into his very own super-vehicle, it's up to our heroes to stop him in his tracks. But for that to happen, Gekko needs to learn that asking for help doesn't make you weak. Catboy's Tricky Ticket - Catboy only has two tickets to the Jayden Houston concert and has to decide which of his best friends to take to the show. Owlette and Gekko offer him presents to sway his decision and Catboy's newfound greed could ensure Luna Girl ruins the concert for good. Clumsy Catboy - Romeo plans to use his newest device to make everyone in the world so clumsy that they can't stop him from taking over the world. But when agile Catboy is the first to be "clumsified", he can't admit it and tries to save the day without any help. With a running time of 72 minutes, it is the perfect length to keep little ones entertained (whilst also allowing us parents a few moments of peace)! It has a U rating, so it is suitable for all the family to enjoy and I must admit that I quite like watching the episodes too. Riley's favourite character is Gekko, so as I read the list of episodes to him, he was excited that the first episode was all about Gekko and the Snore-A-Saurus. The title alone captured his attention and so we lay in the den together to begin our PJ Masks episode marathon. 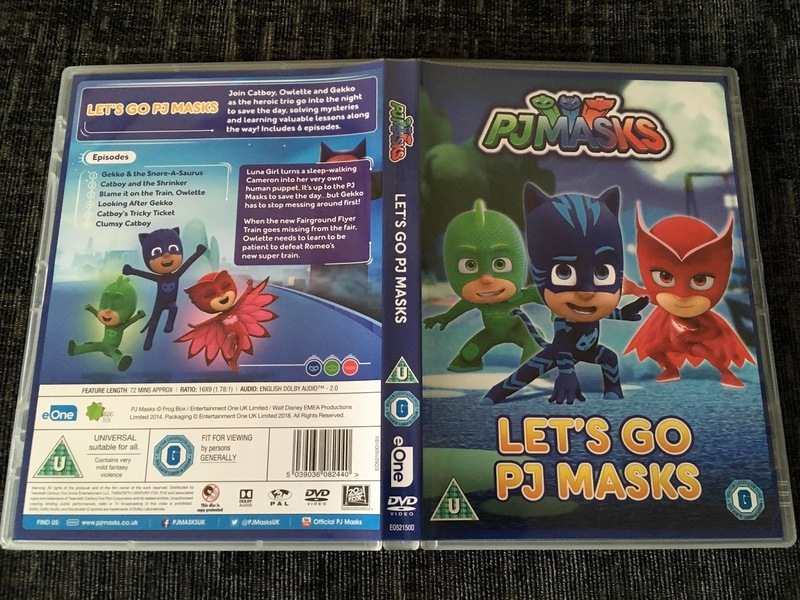 One element of the show that I particularly like is that there is usually an underlying message in the episodes that not only teaches the PJ Masks trio some valuable lessons, but also gives children watching the programme something to think about. Riley thoroughly enjoyed all the episodes and as well as finding the DVD entertaining, he thought some parts of the show were really funny too. His favourite episode was Looking After Gekko, which he asked to watch again several times after the full DVD had finished. Featuring vibrant and loveable characters, it is easy to see why PJ Masks is so popular with young children. The episodes on this DVD are great fun and packed full of adventure and excitement that I know Riley will want to watch over and over again. If the action-packed DVD itself isn't enough, then children will also love the fun free stickers that are enclosed. These are great for making a little PJ Masks picture or could even be used to decorate the DVD case and add a personal touch. The DVD is available to purchase and download from 5th February, with Amazon currently offering buyers the chance to pre-order it for only £7.99! If you are feeling lucky however, then why not enter our fantastic competition below, for your chance to win your very own copy of the DVD. Simply have a read through the T&C's and then enter using the gleam form below. Good Luck! 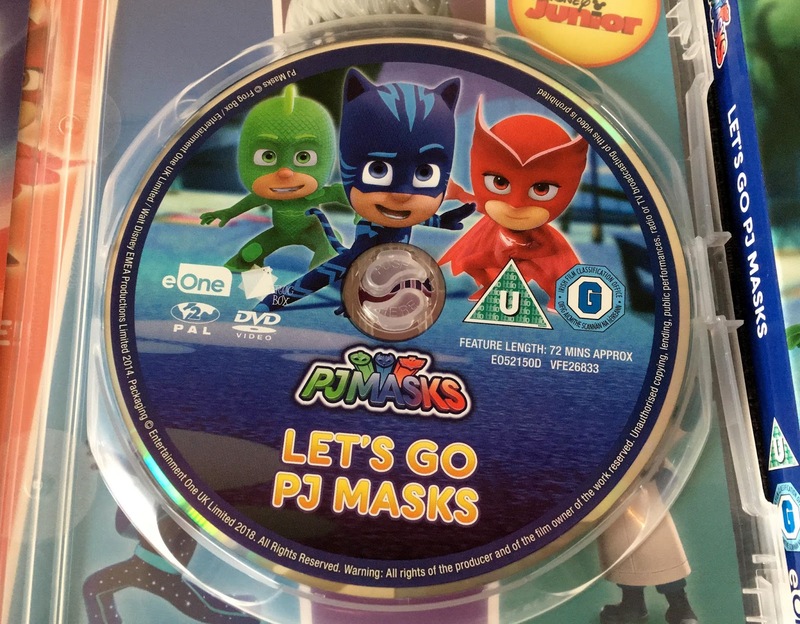 There is 1 (one) prize of a Let's Go PJ Masks DVD. Entry is open to UK residents aged 18 years or older. Competition closes on Sunday 11th February at 12 noon. The winner shall be drawn at random and contacted by email within two working days. The winner shall have 14 days to reply to the winning email notification to claim their prize, before an alternative winner from the remaining eligible entries is drawn. The winners details only shall be shared with the promoter, for the purpose of prize fulfilment. Disclaimer: We were provided with a complimentary copy of the DVD for review purposes. This post contains an affiliate link. Price of £7.99 correct at time of writing 23/01/2018 but may be subject to change. Have to mention CATBOY who is my great-nephew's favourite.